This incalmo vase features 3 separate sections that come together to form a stunning piece vase. Each section was formed as its own separate molten bubble, then they were fused together and blown out as one unified bubble using the incalmo method. 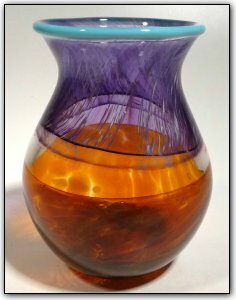 The bottom section features many shades of topaz, then a band of clear followed by a band of lovely purples, and how better to top off such an elegant vase than a baby blue lip!